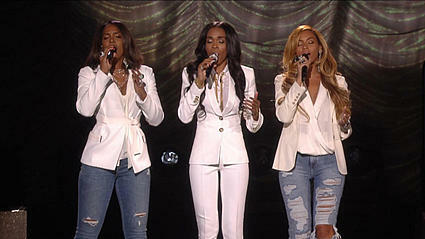 Now as I’m sure you know by now Kelly, Michelle and Beyonce performed at the Stellar Awards in Vegas over the weekend. Now, mind you we get a call Monday and the Shade was REAL….. Before we spill it, catch up. Now Gurl, is it US or did Kellys baby take away a few octaves??? Though we can’t hit a note to save our lives we know what it SHOULD sound like when you are trying to hit some range. Chile those sounds were sounds of the LOST Ranger. Second, Haaaaay Kelly. No Shade but who told you it was okay to wear pregnancy hair to the awards? Now bytch, I know you excited cuz you finally got some hang time and all, but you def needed a touch-up, a touch on and a touchdown, Okay. That hair was so PUFFY and THICK. Then did you really just swing it like you was in the Pantene Pro-V commercial????? Gurrrrrrrrrrrrrrrrrrrrrrlllllllllllllllllllllllll, just cause you seen J-Lo in the new commercials don’t mean your a candidate for the next draft.